Statues and sculptures work well when incorporated into a garden water feature. They are commonly used as a fountain or design focal point, but you can use them however you like. There are hundreds of different styles and shapes available to use. 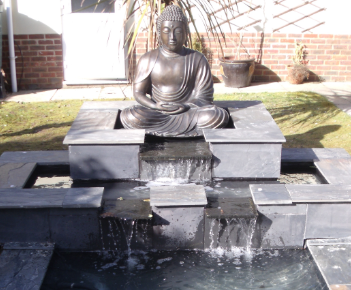 The bespoke water feature below incorporates a 1 meter high bronze Buddha. The feature was originally going to be constructed from natural stone which in our opinion would have detracted from the possible overall effect. Water Scenes designed a more simple and formal concept. The 3D design below is a visual representation which allowed us to share our ideas in detail. Water Scenes design and construct water features throughout the UK. If you would like a pond design or water feature from Water Scenes contact us or call 0800 0232 988. The picture below shows the finished water feature.